From two popular bloggers and leaders in the functional medicine movement, here’s the ultimate guide to eating healthfully as a family—a simple, practical cookbook that shows how easy it is to ditch processed foods one meal at a time with 365 delicious, whole food-based, allergen-free recipes that the entire family will love. It can be daunting to live a whole foods lifestyle in today’s busy world—even more so to prepare plant-rich, allergen-free meals that’ll get the whole family around the table. 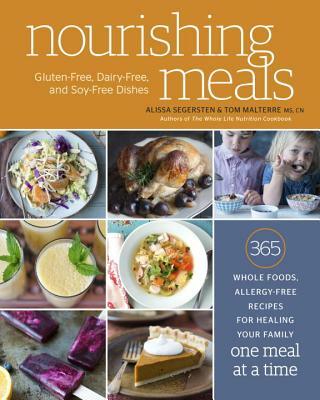 Popular blogger Ali Segersten and functional medicine expert Tom Malttere are a team devoted to teaching their children—and readers—the importance of living a whole foods lifestyle. Nourishing Meals makes it easy and fun with dishes that burst with flavor, such as their Cherry Pecan Salad, Butternut Squash and Pinto Bean Enchiladas, Chipotle-Lime Roasted Chicken, and Banana Coconut Cream Pie. With an easy, tasty recipe for every day of the year, it’s never been simpler to adopt a healthy, whole foods lifestyle! Tom and Ali are often described as "food whisperers" who speak and write on the connection between diet and autism, fertility, and raising healthy children. They live in Bellingham, Washington.